What exactly are role-based certifications? It simply means that you, as a candidate, has the knowledge and skills required to be equipped with the current and upcoming technical roles and requirements. 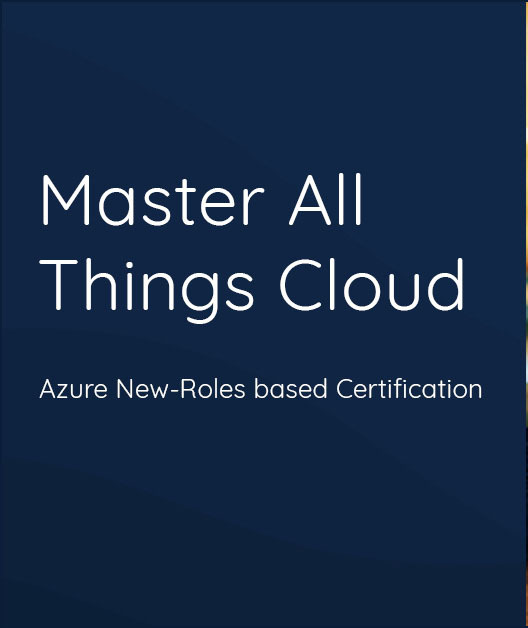 In this case, Microsoft Azure role-based certifications [new launched] enable the professionals to prove their expertise level and skills to prospective employers, peers, and others in the same community. Not only these are a breakthrough technology upgrade among Cloud technology aspirants but also among those who are already qualified & holding Microsoft Azure certification technologies. Who is going to be benefited the most? These Microsoft Azure Role Based Certifications [New Launched] are specifically developed & designed for professionals specifically – Azure Developers, Azure Administrators, and Azure Solutions Architects. Besides, showcasing your newly gained and industry relevant skills, these certifications and training programs prepare you for an advanced Azure career. The awesome fact is that there is a huge requirement for Microsoft Certified Azure Solutions Architect from organizations. In past one month only, there is a demand of 6099 postings in various popular job posting biggies such as LinkedIn, Naukri and Indeed. It proves the relevancy and demand of the growing market of Microsoft Azure certifications. Upon completing the Microsoft Certified Azure Solutions Architect, you confirm your mastery over the skills required to design solutions that are run on Azure. As a prospective candidate for all these job vacancies, you must have the expertise to compute, network, storage, and security. Microsoft Certified Azure Administrators are at the top of the charts when it comes to the in-demand Microsoft Azure professionals list. During the past month only, there is a demand of () postings in various popular job posting biggies such as LinkedIn, Naukri and Indeed. All come down to one thing, you pursue the apt training and pass the Microsoft Azure Certification (New Azure Role-based certification) and showcase your industry relevant skills. An ideal Azure Administrator is responsible for monitoring, implementing and maintaining Microsoft Azure Solutions including significant services related to storage, compute, network and security. The need of the hour is to upskill your profile to be more employable a become the perfect match to industry requirements. With Microsoft Azure role-based certifications you get better recognition of your role-based expertise upon completion of the certification. Microsoft Azure is the cloud for modern business. Expand your skills with new Azure training and certification and meet the current industry need and future-proof your skills. As we already know Microsoft is in the process of launching new role-based Azure certifications. The old certifications are being retired giving place to the new ones. And, then there are certain transition exams also. The Microsoft Azure transition exams let you upgrade to the new certifications instead of the older versions such as 70-532, 70-533, 70-535. If you have already passed the old ones, you can follow the transition paths to migrate to the newer ones. So, if you are previously certified in Microsoft Azure, evolve with Microsoft now, take advantage of Microsoft Azure transition certification exam.